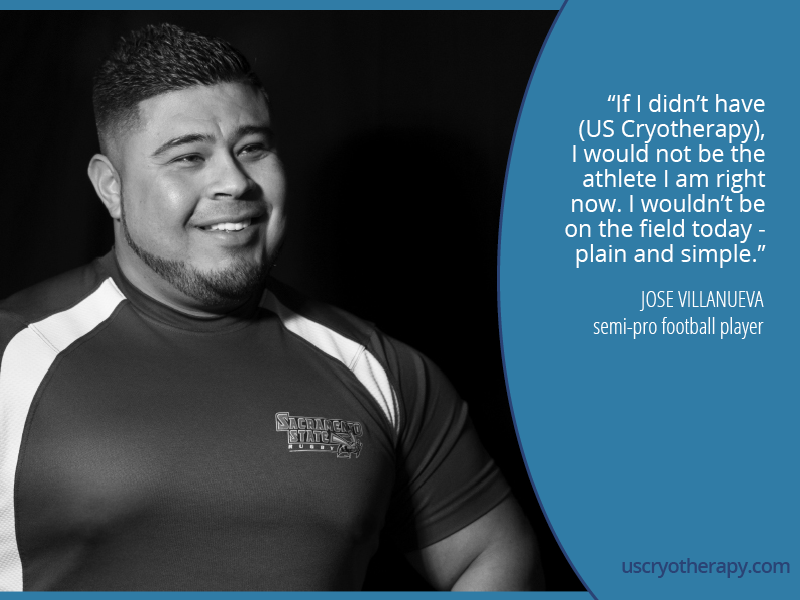 Semi-pro football player Jose Villanueva didn’t know how good he had it when he first experienced US Cryotherapy. At the time, he was injury free, pain-free and competent on the field. Fast forward a few years and two injuries. “I believe my recovery time would have been cut in half had I used US Cryotherapy then,” Jose said of the first injury, a torn achilles that kept him off the field for several months. His recovery routine for that injury consisted of ice baths and pain medication, which barely touched the pain and did nothing for inflammation, Jose said. When he injured his knee soon after, Jose decided to empower his wellness and recovery with US Cryotherapy. It paid off, he said. Jose continues to use US Cryotherapy three to five times a week for maintenance, injury prevention and performance enhancement. Disclaimer: Information contained within this website and on all US Cryotherapy printed material is for informational purposes only. US Cryotherapy does not recommend cold therapy as a form of treatment for any illness or disease without direction from your healthcare professional. All material contained within this site is copyrighted. All rights reserved. The cold therapy products and equipment have not been tested or approved be the FDA or any other government agencies. Use at your own risk.